« Does Wil Wheaton have what it takes to rule Naqala? This bundle includes Talisman Digital Edition (with the Frostmarch Expansion), Magnifico, and Small World 2 for PC/Mac/Linux with its existing expansions. And if you pay $7 or higher, you’ll also get Ticket to Ride for PC/Mac/Linux including its current expansions, and on top of this you will also get 100% Orange Juice with a Character Pack and Catan: Creator’s Edition. 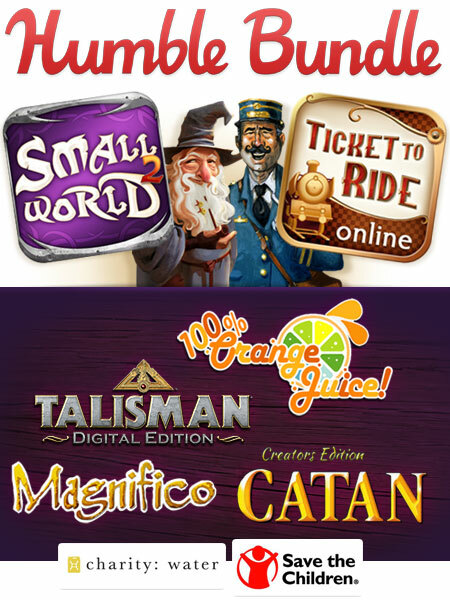 If you already own and love Ticket to Ride and Small World 2 on your PC, Mac or Linux computer, these other games are pretty cool to have; and if you own only one of them, or miss some expansions, here is the opportunity to get the whole thing at a great price! So go ahead and check out Humble Weekly Bundle: Tabletops. It’s your chance to get all these games in one terrific bundle for the price of your choice AND your contribution will help support two charities – charity: water and Save the Children. For all the specs and to learn more about the games, visit the Ticket to Ride and Small World 2 pages of the Days of Wonder Online website. This entry was posted on Friday, April 10th, 2015 at 13:08 and is filed under Days of Wonder Online, Games, News, Small World, Ticket to Ride. You can follow any responses to this entry through the RSS 2.0 feed. Both comments and pings are currently closed. Will this include the Royal Bonus expansion for Smallworld 2? Hmm… So I somewhat answered my own question. @Dan : The Royal Bonus is indeed a part of the Bundle. And it’s attached to your DoW account rather than your device. So if you own the game in more than one platform it is supposed to unlock every where and it’s not supposed to disappear of course. Are you sure you were logged on the second time? Am I allowed to gift some of the games and keep others. Should the Mac version also make it available for the iPad or is this a separate purchase?